Who is your favourite player? Do they play on your favourite team or do you cheer for a player who isn’t on your club but you wish they were? Growing up a Devils fan, I didn't have many superstars on my club until the early 90’s when Scott Stevens and Martin Brodeur starting calling the Meadowlands home. Scott Stevens was a Devils thanks to an arbitrator and the signing of Brendan Shanahan by St. Louis. Brodeur of course was a Devils draft pick in 1990 and he didn't really play any significant amounts until 1993 when he started as Chris Terreri’s backup before guiding the Devils to the Conference Finals against the Rangers and winning the Calder Trophy. So that meant whenever I had to answer the “who is your favourite player?” question, I often got strange looks when I chose a player from my club. Like many kids I grew up idolizing Gretzky, but when it came to my favourite player, my guy was John MacLean (not the Die Hard guy). I began my insignificant hockey career wearing number 15 and I wore it for a couple seasons before switching to 12 in honour of another Devil, Bill Guerin. Johnny Mac was a staple of the Devils offense for nearly 15 seasons. He began with the club as the 6th overall pick in the 1983 NHL Entry Draft and played 23 games during the 83-84 season where he only scored 1 goal. He did play with the Oshawa Generals again that season where he tore it up for 23 goals and 59 points in 30 games. 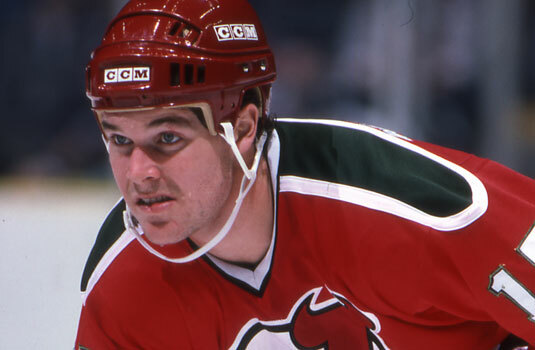 That would be his last stint in junior because after the start of the '84 season he would stay with the Devils until he was traded to San Jose in 1997. During his time with NJ, he would score the biggest goal in their franchise history to date and many more goals during their first historic playoff run in 1988. I actually remember seeing that goal as a “cut to highlight” during Hockey Night In Canada. I must have jumped up and down for a minute after seeing that goal. The Devils would go on to win their first two playoff series before eventually losing in the Conference Finals to the Boston Bruins in 7 games. It really didn't matter who won the Conference Finals because the Oilers were going to annihilate whoever won between the Devils and Bruins, but making it that far gave me hope as a fan. 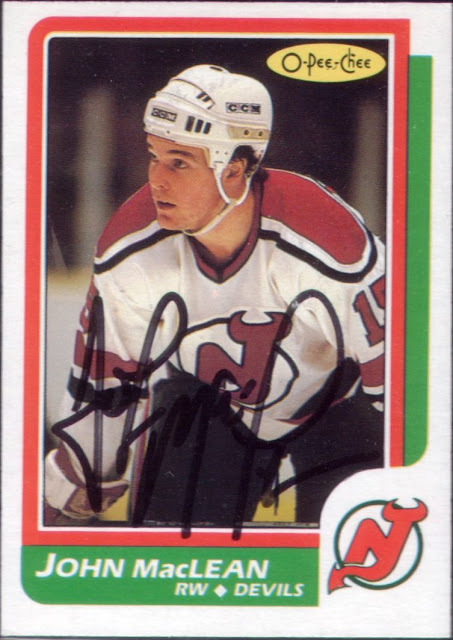 When John MacLean retired he was the Devils all-time leader in goals (347) and points (701). Since then he has been passed by Patrik Elias, but to this day remains the best right winger in franchise history. His career numbers are 419 goals, 429 assists and 842 points in 1194 games which are very solid, but not Hall of Fame worthy. After his retirement, John did get into coaching and was an assistant coach with the Devils when they won in 2003. He would then leave the big club to start his career as a head coach in the AHL. He did very well with the Devils farm club which earned him a chance to coach the Devils which ended horribly. But like they say, you can’t keep a good man down and John is back coaching in the NHL with his former linemate, Kirk Muller, in Carolina as their assistant coach. The first autograph is his rookie card which I really hoped that he would sign. I had a couple of these ever since I was a kid and being his most “valuable” base card it was fun to get one signed. The book value on this card is a mere $4, but priceless to me now that it is signed. The second auto is from one of my favourite sets of all-time 1990-91 UD. The card features a pretty nice action shot with John wearing the old retro red and green jersey. I even had that Titan TMP 2020 stick when I would play at the outdoor rinks. 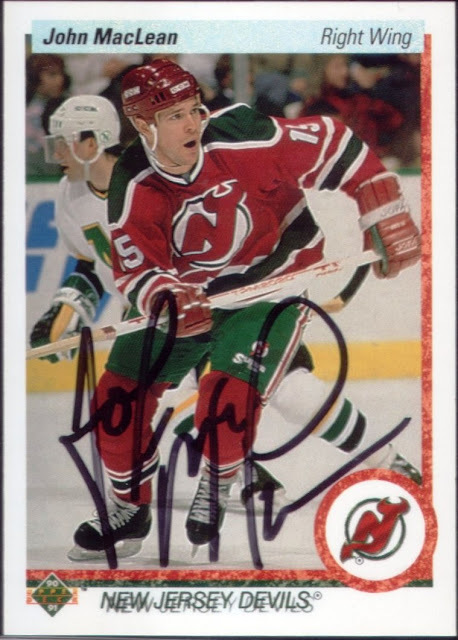 So even though it isn't my most exciting return from most people’s perspective, I really cherish getting a pair of autos from my childhood hero and former Devil great John MacLean. Next post will be someone most can appreciate. My father was a huge Devils fan and always talked about how great John Maclean was. He and Scott Stevens were his favourite guys.